Morning Motivation — What gets you in the flow? 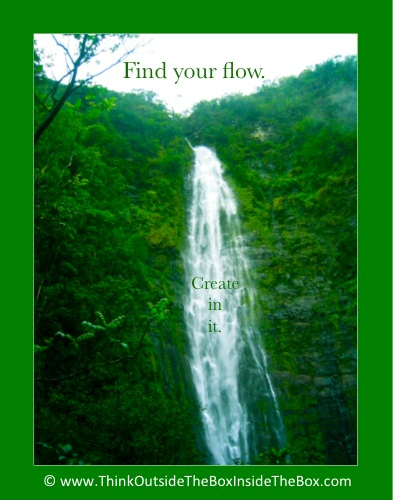 What gets you in the flow? What gets you in the flow—that motivated, glorious state of single-minded focus where the world melts away and it’s only you and your creation? Clear your schedule. Carve out the time. Shut off the electronics. Turn off the phones. Send the kids on a play date. Go to the library. Go to the beach. Meditate. Turn on your favorite music. Dance. Do whatever you have to do to prepare yourself for getting into the flow of creating. In order to give yourself a chance to reach flow you have to prepare for it. You have to allow for it. You have to welcome it. You have to invite it in. Create an atmosphere that lets you deeply step into and connect with your creativity.